PRO SE PRODUCTIONS ANNOUNCES LATEST PULP OBSCURA VOLUME- LESTER DENT’S LYNN LASH RETURNS TO FACE NEW DANGERS! Known for breathing new life into rare, nearly forgotten classic Pulp Characters, Pro Se Productions announces the latest release from its Pulp Obscura imprint, in conjunction with Altus Press. 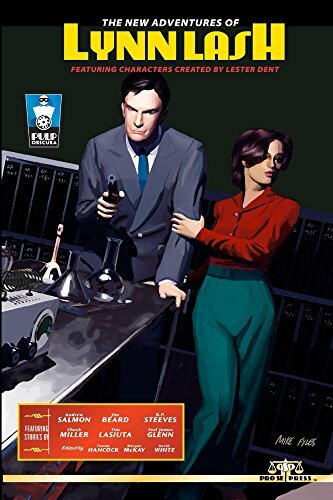 A character created by one of Pulp’s most renowned authors returns in a collection of all new adventures authorized by the legendary creator's estate. The New Adventures of Lynn Lash is now available in print and digital format. Lynn Lash was created by Lester Dent, the man responsible for one of pulp fiction's greatest and most enduring adventurers, Doc Savage! Lash made his first appearance in 1932 in Ace's Detective Dragnet Magazine. His few stories contained many elements that Dent used when he began writing the adventures of the Man of Bronze. Lash lives and works in a skyscraper headquarters in the heart of the city. He operates as a special consultant to the police, investigating unusual scientific threats beyond their abilities. Lash has an amazing array of equipment and devices of his own design that he employs in his cases. Occasionally aided by his secretary, Rickey Dean, Lynn Lash uses his formidable intellect and astonishing inventions to defeat the schemes of madmen and win the war on crime! From Out of the Past Comes New Tales of One Of the Gadgeteers of the Golden Age! Pro Se Productions in conjunction with Altus Press presents a new volume in its Pulp Obscura line! Bringing adventures and heroes lost in yesterday blazing to life in New Pulp tales today! Six tales featuring Mechanical Marvels and Maddening Mystery from Andrew Salmon, Chuck Miller, Jim Beard, Tim Lasiuta, R. P. Steeves, and Teel James Glenn! Pulp Obscura Proudly Presents The New Adventures of Lynn Lash! Featuring a fantastic cover by Mike Fyles and logo design and print formatting by Sean Ali, The New Adventures of Lynn Lash is available now at Amazon at http://www.amazon.com/New-Adventures-Lynn-Lash/dp/1511437278/ref=sr_1_1_twi_2_pap?ie=UTF8&qid=1427980279&sr=8-1&keywords=lynn+lash+new+adventures and Pro Se’s own store at www.prose-press.com for $15.00. The eBook edition designed and formatted by Russ is available for only $2.99 for the Kindle at http://www.amazon.com/New-Adventures-Lynn-Lash-ebook/dp/B00VFCEE0O/ref=tmm_kin_swatch_0?_encoding=UTF8&sr=8-1&qid=1427980279 and for most digital formats via Smashwords at http://www.smashwords.com/books/view/531739. For the original tales of Lynn Lash as written by Lester Dent and reprinted by Altus Press, go to http://www.altuspress.com/shop/hell-in-boxes-the-exploits-of-lynn-lash-and-foster-fade/.